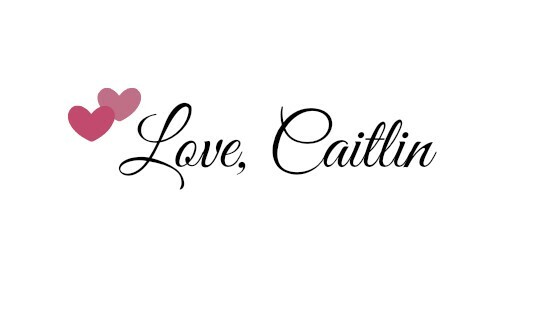 Now that definitely sounds promising right? Let's see what I thought. Often I consider myself lucky if a mascara can curl my lashes and make them visible and long without it smudging or flaking off during the day, and that is important to me. 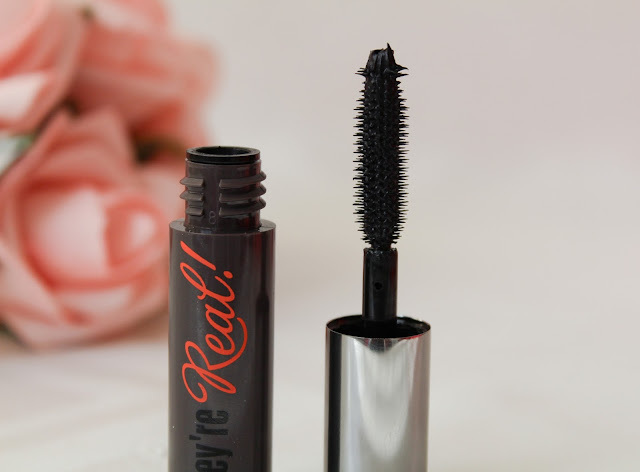 Many people have raved about this mascara so much and they say that it gave their lashes amazing length, volume and curls them, almost like they are wearing falsh lashes. I think one of the things that people always mention is the mascara has a spiky ball at the end of the applicator wand... which i'm not sure mine came fully equipped with. I'm not sure if I got a dud one or if all the mini versions of this mascara were made to not have them or to have maybe half a spiky ball? It really doesn't stink because that spiky ball was supposed to be one of the super magical parts of the mascara and make all the difference. This version is less than stellar at getting to the small lashes in the inner corner of my eyes. I mean it does get the small lashes but it tends to just clump them up instead of seperating and defining them. That aside, the small length of the wand in the mini version actually helps to make my lashes look long. This mascara is a smudgey little bugger, after just a few hours of wear I somehow managed to have this smudged underneath my eyes, even when I only where this on my tops lashes. I don't have oily eyelids at all or oily skin for that matter, so I have never had the problem with my mascara smudging before but this mascara somehow managed to do just that. I have to admit, I've never had smudging with other mascaras before so it was so dissapointing when this did smudge as it ruined my makeup. I did try to wear this and put extra powder underneath my eye area to see if that helped but it didn't, which was dissapointing. I don't have oily eyelids, so I can't pin point what is causing the smudging. The "They're Real" mascara is also a pretty wet formula so there is a specific amount of time to let this dry down before you can blink safely. It is definitely something that I don't like to have to think about in the morning when I'm half asleep and just don't have the patience! Also, if you have naturally long lashes that can hit your browbone then this can just get messy because of how long it takes to dry. This was so difficult to take off though, I use Micellar water to take my makeup off and that normally makes everything easy to remove. However, this mascara did not want to budge at all, it took a lot of cotton pads and a lot of Micellar water to get this stuff off. I don't really have any specific feelings about the packaging. It's annoying with the mini version that the lid shows up fingerprints so easily but I like that it isn't a bright obnoxious colour and it's just a simple packaging that look sleek. I only have the mini version so I can't comment on the full sized one and how that packaging might be. The applicator is not what I normally prefer, I tend to like ones that are not as busy and have a slight curve to them as it helps to curl my lashes at the same time. 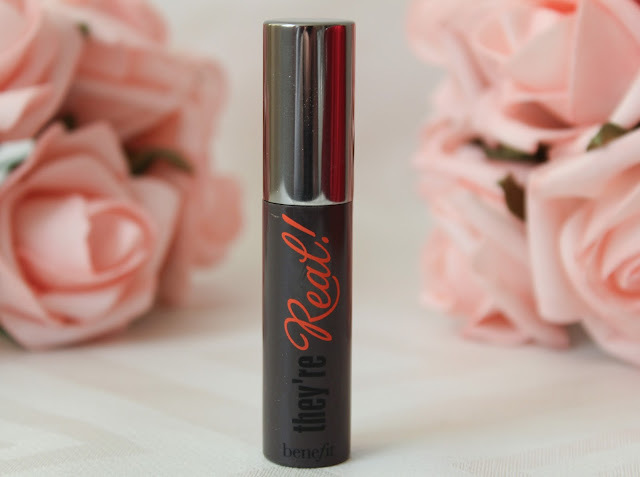 All in all, for a mascara that claims to give a false lash effect and how everyone is raving about it, I expected a lot more from a mascara that retails for £20. Yes, it does give my lashes a lot of length and volume but it doesn't curl them or make them stand out as much as I would like them to. In fact, I get better results from my Maybelline Lash Sensational mascara which is only £7.99. Have you tried this mascara and what do you think about it? Let me know in the comments below. I liked the wand of this mascara but it didn't really do anything phenomenal for my lashes, it didn't hold the curl which I expected it too. Yeah I like the wand too! But I agree with you on the curl part, it didn't hold the curl on my lashes either.